Samsung NX Mini and Sony RX100 are two compact digital cameras that are each armed with a 20MP one-inch backside-illuminated (BSI) sensor. Thanks to the BSI technology, compact digital cameras can now stay slim and lightweight while having good brightness and better performance. 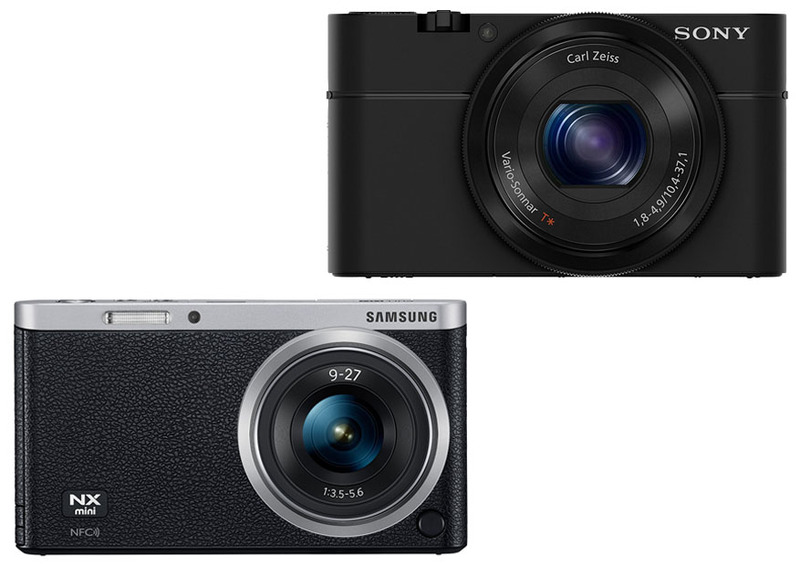 So, between Samsung NX Mini vs Sony RX100, which one is the better camera? Below, we will compare these two models against each other to help you choose. So, continue reading! Both Samsung NX Mini and Sony RX100 are widely regarded as compact digital cameras, but how compact are they actually? Samsung NX Mini is the smaller and lighter one of the two – it measures only 110 mm x 62 mm x 23 mm with a weight of just 196 grams. In fact, this model has been boasted by the company as an ultra-slim camera. This is a great choice if you prefer a simple camera that you can pocket around. The housing is made of magnesium and plastic. The rear panel features a three-inch tilting touchscreen. Sony RX100 is slightly bigger and heavier at 102 mm x 58 mm x 41 mm and 290 grams. However, the housing feels much more durable. The housing is made of sturdy aluminum that can withstand abuse. Unfortunately, just like Samsung NX Mini, Sony RX100 is not weather-sealed. So, it is not impervious to water and rain. On the rear panel, you can find a three-inch tilting display. The resolution is much higher, making the images more pleasant to look at. See also: Panasonic LX100 vs Sony RX100. Both of the two models come with built-in Wi-Fi for easy connectivity. Samsung NX Mini has an impressive maximum shutter speed of 1/16,000s, while the ISO ranges from 160 – 12800 (expandable to 100 – 25600). It also has a mic port, which can be handy for video projects that require good audio quality. However, it does not have a viewfinder and image stabilization. The continuous shooting speed is only 6 fps, so it is not very good for photo bursts. On the other hand, Sony RX100 features a built-in viewfinder and optical image stabilization. The stabilization is definitely very useful, as it can reduce the blurs on your images. The AF performance is quite impressive. It is fast and accurate. The continuous shooting speed is also quite good at 10 fps. This model has a built-in ND filter, which will allow you to use a larger aperture under a strong light. Last but not least, the big difference between Samsung NX Mini vs Sony RX100 is the battery life. Samsung NX Mini has a significantly longer battery life. It can last for 650 shots per charge. On the other hand, Sony RX100 can only last for about 320 shots per charge. Unless you need built-in image stabilization, Samsung NX Mini is more recommended. This model gives a better value for the money. It is slim and very portable, and the features are quite good. The battery life is also much better. On the other hand, Sony RX100 is quite a powerful camera with great AF and stabilization, but the price is quite expensive for the features.